Excellence in engineering is Audi’s claim to fame, and with state of the art technology and superior driving performance, it’s no wonder that these German luxury vehicles are growing in popularity throughout the Evansville and Newburgh area. At Menke’s, our commitment to technology is a perfect match for Audi’s spirit of innovation, and we’re proud to present the industry leading specialists that make us Vanderburgh county’s leading Audi repair facility. Menke’s is equipped with the factory scanners required to fully diagnose and program Audi vehicles. Combine this with computerized engine analysis and quarterly staff training on the newest diagnostic equipment available, and you get a repair experience that’s just as good as factory service and refurbishing. We guarantee that when your car leaves our shop, your Menke’s experience will make you feel like you’re driving a brand new vehicle. At Menke’s our success has been built upon client service excellence. Our factory-trained Master Certified Technicians are prepared to repair your Audi with precision. As recipients of the ASE Blue Seal of Excellence, and employing a staff with over two hundred and fifty years of combined experience, you’ll know that your car is in being left in the best hands possible. Menke’s is the only AAA Approved Auto Repair Facility in the area, and we’re as passionate about servicing luxury vehicles are you are about driving them. When you walk into our service facility you’ll be treated with respect and courtesy by our intelligent and friendly staff who genuinely care about your concerns. At Menke’s we offer a free loaner car to minimize the inconvenience of being without your vehicle. Customer satisfaction is our top priority and from our free wireless internet to our comfortable home-like waiting area, you’ll be just as satisfied with your repair experience as you are with the repairs themselves. All this and more makes Menke’s Newburgh’s number one destination for foreign car service and repairs. 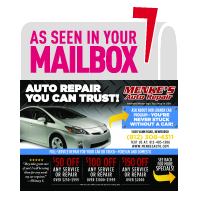 Named #1 Auto Repair Shop in the country by Motor Age magazine, Menke’s offers outstanding car service that you can trust. Angie’s List has given our organization the 2013 Super Service Award and we’re the only AAA Approved Auto Repair shop in the area. Menke’s has also received the ASE Blue Seal of Excellence from The National Institute for Automotive Service Excellence. No shop in the Evansville area is more consistently awarded and praised for exceptional service.